So, I'm self taught in musical notation and identifying music symbols, but haven't ever read a full score. I have one important question that I can't find the answer to. Where (in sheet music) is there in indication where specific sets if instrumentation start and finish? For example, there is a percussion section and a strings section, the percussion section starts first and the strings come in later. Since I wouldn't imagine there would be 3 full pages of rests in the sheet music for the strings that start late (that would be insanely inefficient and a waste of paper), what would indicate the starting point for this late instrumentation? In a lot of scores, there is actually just 3 full pages of rests for those instruments that happen to not play. 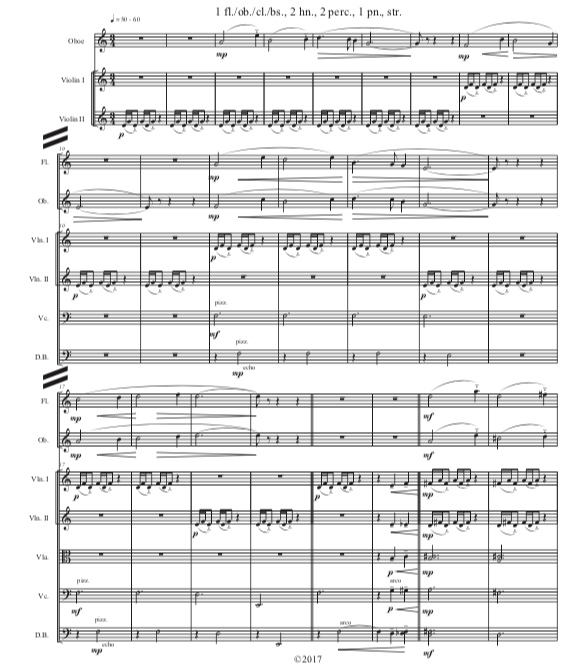 I know many conductors who prefer this visual score style as opposed to the alternative, where instruments that don't play are simply removed from the pages that don't include them (excluding the first page – the example below is a bad one of this). Two slashes are used to indicate a break in the system if only few enough instruments play to warrant a page break. I respect people who are self-taught. I am a self-taught in writing papers too. But I use the service Paperial, that writes my assignments usually, to check what I have learned myself.